Controversy as well as looks ! First ... and so the story goes ....A small SUV in North America .. a proto-type to the Now legendary 4Runner . In 1979 - 1980 the Trekker is conceived by Mr.Tohasheau. With more R & D commanded , several Ideas are conceived by different engineers , and a plan put into place . ? would build a special Wolverine edition , Griffith would build a Trailblazer edition , and Winnebago would build the Trekker . With the Trekker being the best design , in Toyota's eyes , Winnebago would get the go ahead .. some local dealers would , over the years try take credit for the Trekker , but it was a TOYOTA design . The Trekker, was an early collaboration between Toyota and Winnebago to create what can only be described as the precursor to the 4Runner. At the time of it's conception (approximately 1980), Toyota was no longer shipping the Land Cruiser to the US due to fuel mileage ratings. 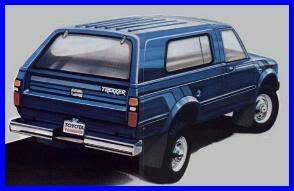 Jack Safro ,who now owns Jack Safro Toyota in Brookfield, Wisconsin came up with the idea of the Trekker. He approached Winnebago, and they in collaboration with Toyota, approved of the concept, and started on the design options. Several vehicles were produced for crash testing. Once approved, production began. Send mail to webmaster@toyotatrekker.com with questions or comments about this web site.